On Monday, I posted a short blog about not wasting life. Yesterday, I posted a video about becoming the pragmatic leader of your life. Today, I want to share with you the best way that I’ve found to accomplish these goals; the best way to not waste life, and be the pragmatic leader of our lives. It’s a solution that comes down to writing our own script. On television, on Broadway or in Hollywood, a production is only as good as the script written for the performance. A film can feature Academy Award winning actors and have the greatest director, but if the script is bad, the whole production will fail. See Gili for further example. The problem for most of us, however, is that we don’t have a script at all. There’s no plan to move our plot along, and when this happens, we follow someone else’s, putting us in the position of wasting our precious minutes and being followers, rather than leaders of our lives. We’re not in control of our lives anymore and if makes us feel stressed and rudderless. We need to write our own scripts. Sylvester Stallone wanted to be an actor. No one would cast him. What did he do? He wrote his own script. It’s time for us to do the same. Our script is comprised of three crucial parts: Our goals, our targets, and our agenda. Miss anyone of them, and you’re like Christopher Walken in a bad movie. The script is the key to success. What is that we want? Out of the day? Out of the week? Out of our lives? This is where the script starts because as Stephen Covey has taught us, we must begin with the end in mind. How much more energy would you have every day if you knew that the actions you were taking would put you closer to achieving your goals? Write them out every morning and focus on what you want. This is the critical plot of our script and we can’t miss it. If our goals are the plot of our script, our targets are how we move the plot along. We don’t want this to drag in the middle, so we need to keep moving forward. The best way I’ve ever found to do this is to set three targets every day that will move me closer to my goals. Three hard things that I will accomplish every day no matter what. Having targets gives us something to measure ourselves against, to find wins no matter how small and keep the positive momentum going. If we’re not striving for our target, whose are we reaching for? All year long, I have two favorite holidays. I love New Year’s day and I love Memorial Day. One feels like a look ahead and the other like a look back. Today, for Memorial Day, my family and I will visit 10 cemeteries and remember not only those who lost their lives protecting our freedoms but also those from our lives whom we’ve lost. Visiting the headstones of grandparents, great-grandparents and aunts and uncles has been a family tradition that we’ve passed onto our children and everyone seems to enjoy it. Every year, there’s one place that I enjoy going the most and that’s to a bronze plaque located in Fryburg’s cemetery that commemorates all of the locals who served in World War Two. There are fifteen names on the plaque and one asterisk. The lone asterisk is for the one man who lost his life in that great war, my great great uncle Joe. This post isn’t about his sacrifice or his service. He died in 1943 and almost everyone who knew him is gone too, but what always strikes me about that plaque is how young he was at 19. A young life cut down before his prime like nearly 450,000 others. For him, life was short. We say it all of the time: “Life is short”. But is it? This weekend, I’ve been reading Seneca’s On The Shortness Of Life and in the first chapter, he makes the point that we have all of the life we need if we wouldn’t waste it. It shifted my thinking about life and how I live it. How many days have I lost to idleness? How many times have I been on my phone scrolling needlessly through Facebook when I could have been having a real conversation with the person next to me? How much of my life have I wasted? For hundreds of thousands of brave young men and women who have paid the ultimate sacrifice on the battlefield, yes, life is short. But for the rest of us, what’s our excuse? We have all of the life we need, if only we live it. If your life were a movie, and it started now, what would the hero of your life’s movie do right now? He said, far too often we define ourselves by our past and say, well that’s me, but that’s not you, you’re the person that’s learned from those failures and you can choose to be the hero of your own movie. I just about fell out of my chair as his words hit me right in the gut and two thoughts raced through my mind. How am I so inspired by a guy who used to make people eat worms for money? I wasn’t quite sure of the answer but I knew what the hero wouldn’t be doing. I’ve watched a lot of movies and I’ve never seen the hero wasting his time watching YouTube at 9:00 in the morning. And then the ad continued. I had the chance to skip it like I do with every other ad that pops up, but I didn’t. I sat there with my eyes transfixed on the screen and watched as this tattooed MMA commentator hit me with the brutal facts of life. And it closed by telling me to be inspired. To write down who I want to be and go forward as the hero the hero of my movie. [embedyt] https://www.youtube.com/watch?v=-QJSvjjgb3g[/embedyt] I went looking for more and on his podcast, he said in every movie the hero starts out in the gutter. A guy with a gun in his mouth until he sees a picture of his kids, Arnold Schwarzenegger rolling out of bed and putting pizza, ice cream and potato chips in a blender for breakfast. But then something happens and that loser, that guy whose life is going nowhere, takes control. At this point, I was thinking WHY NOT ME? Now, I couldn’t tell you what the guy was selling or why the ad was on so from that standpoint, it was pretty ineffective, but all of a sudden, my hair was on fire. I saw possibility in everything. When I looked at my desk I asked, who works like this? Not the hero of my movie, so I cleaned it up. I looked back at my computer that had YouTube playing and asked, who watches Youtube in the middle of the day? Not the hero of my movie, I turned it off and started making my task list. After I had listed all of the things that I had been putting off, letting slide and simply neglecting, I felt as though a weight had been lifted from my shoulders with a crane. In a little over two hours of time, I had completely reorganized my office, written two pretty important letters and finished a project that I had convinced myself would take months. Who could have pulled off this amazing feat, The hero of my movie, that’ s who? Was this going to last? Who knows. Zig Ziggler once famously said that motivation isn’t permanent, but neither is bathing, that’s why they recommend you do it on a regular basis. Every time I feel myself begin to drift or my mind to wander, I ask myself, what would the hero of my movie do right now. That little line has kept me going ever since. Right now, I’m kind of struggling. Oh, I know, I’m not supposed to tell you that. I am supposed to cultivate and curate the image of the person that has it all together in order to come across as credible with the advice I give. I could do that, but I would rather be honest with you tell you the truth. I’m struggling. You see, like everyone I know, I have a lot that I want to get done. That doesn’t make me unusual, but the fact that I’m stalled in my progress makes me frustrated. My frustration lies in the fact that most of the things that I need to do require the help and support of people who also have a lot that they want to get done and our priories aren’t the same. All I want to do is to act, but at the moment I have to wait. Up until this morning, this was causing me a lot of stress until I discovered something that I am finding to be a universal truth. Planning is a poor substitute for action unless planning is the only action you can take. The end of May means that another class of high school and college seniors will end yet another chapter of their lives before making their splash into the real world. Before they get there though, there are three quotes from the movie world that I believe hold some important truths that might be the keys to building great careers. There is a lot of power in this quote from Don Draper, a man who more than any who never lived, was able to recreate himself. The point of the great quote is that each of us has that same power. If we don’t like what’s being said about us, we can change the conversation. We’re in control of our brand. If we don’t like what our boss says about us, we can change that conversation. If we don’t like what our customers are saying about us, we can change the conversation. By this I don’t mean change the subject, any fool can do that, and they will indeed look foolish. What I mean is to get better. To make the conversation about how great you are, rather than our failings. Every day we get to choose if we’ll show up in our lives, and if we choose to correctly, we can change the conversation. 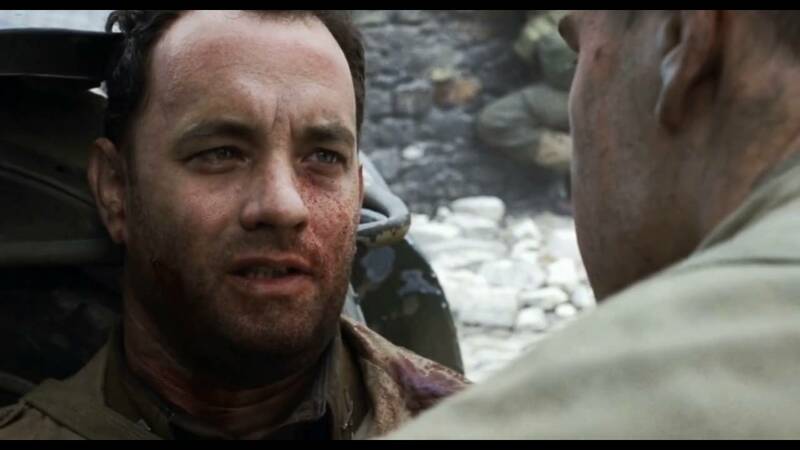 I love the movie Saving Private Ryan and my favorite scene comes at the very end of the movie when Tom Hank’s character is dying on the bridge and he pulls Matt Damon’s Private Ryan close to him and tells him to “earn this.” It’s a powerful scene that calls to mind all of the sacrifices that went into saving Private Ryan. Most of us will never have someone die for us on a bridge, but all of us have people that sacrifice for us to make it to where we are. It might have been parents, teachers, coaches, mentors or a combination of all of the above, but there are those who paid a price for us to be successful. Our job is to earn it and we earn it by paying it forward. If people help you get to the top and you don’t return the favor to those still struggling, you’re dishonoring the many sacrifices that others made for you. The absolute greatest gift that you can give those who have helped you is to help others. Be a mentor, an example, and guide to others and earn this. Video: How Would You Prepare? Randy Fisher http://randy-fisher.com/wp-content/uploads/2019/02/Turning-Manager-Into-Leaders-300x138.png Randy Fisher2017-05-16 10:00:552017-05-16 10:00:55Video: How Would You Prepare?